The Z-Wave Home Security Suite Essential pairs with the Wink Hub (sold separately) to create a customizable, expandable home security system, all controllable via an Android or iOS app. The suite includes two door-window sensors and a motion sensor. Once the system is assembled and connected, you can survey activity and control reactions via your Apple or Android smartphone or tablet. You can expand your system with additional sensors, door locks, light switches and dimmers, and other peripherals (sold separately). Once the products are connected via the Wink Hub, you can sync sensors to other products to trigger actions, such as a light turning on when motion is detected. 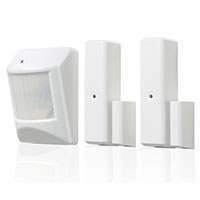 This Z-Wave Home Security Suite system also works with other Z-Wave hubs and controllers, sold separately. Set one by your toilets, water heater, under sinks, and even near water-using appliances like washing machines and dishwashers. 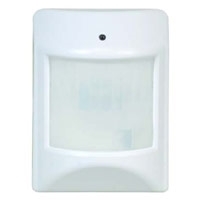 The WAPIRZ-1 Wireless Z-Wave passive infrared motion detector (PIR) is a wireless indoor security device designed to sense and report motion activity and transmit alert signals via a Z-Wave network. The PIR comes with a long-life battery, and provides a low-battery alert signal when the battery needs replacement. The PIR also includes a temperature sensor that can trigger an alert based on specific changes to the room’s temperature. 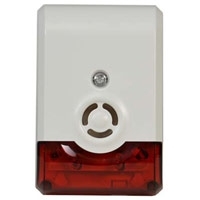 The WA105DBZ-1 wireless Z-Wave enabled combination sounder/strobe warning device, designed to alert intruders of a security system presence. 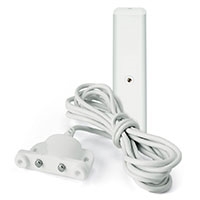 Once paired with a compatible Z-Wave controller or hub, the sensor can be turned on or off remotely via the Z-Wave controller and network. When on, the sounder emits a very loud 105 dB alert tone and the integrated strobe flashes brightly.